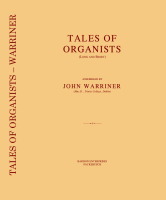 Description: This book contains over 400 anecdotes, tales, comic passages, which have been supplied by various organists. This makes a most amusing collection, and also gives an insight into the lives of 19th and early 20th century organist and choir masters. The various chapters are entitled: Tales which are (probably) Stories; Tales Which are not Stories; Rather Longer Tales; Tales in Verse; Obiter Dicta; “Best” Stories and Tales which have been docked; Containing a Moral without a Tale; Tales with a Beginning and no Particular End; Tales Without a Beginning, but with an Unmistakeable Coda; Stories of the Supernormal; Conundrums and Howlers. Warriner, Dr John. Mus.B. (Dublin, 1887), Mus.D. (Dublin, 1892), F.T.C.L. Studied at Trinity College, Dublin; in Leipzig, Brussels and Milan; pupil of G. Riseley. Organist of Dunster Parish Church, 1880-84; St. Andrew’s, Minehead, 1884-1887; Minehead Parish Church, 1884-87; St. Matthew’s, Denmark Hill, London, 1887-. Professor of piano and harmony at Trinity College of Music, London; lecturer of piano and sight reading at the University of London; president of the London Society of Organists. Composed church music, organ pieces, &c. Wrote about music. b. Bourton, Shropshire, England, May 12th, 1858; d. Denmark Hill, London, Mar. 1st, 1938.